PT Bhanda Ghara Reksa (Persero) – BGR or known as “BGR Indonesia” is a well-established state-owned company in Indonesia, running business in logistic and warehousing services. BGR Indonesia has core business competencies in logistic services, transportation, warehousing, courier services and freight forwarding. PT Bhanda Ghara Reksa (Persero) is a non listed state-owned company and is fully-owned by the Government of Indonesia which represented by the Minister of State-Owned Enterprises (SOE). 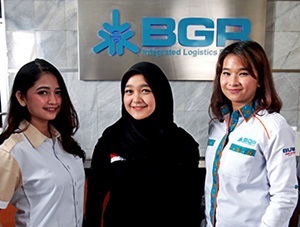 Based in Jakarta, BGR Indonesia runs its business through 24 branch offices and directly employs nearly 1,424 staff spread across Indonesia (as of December 2016). BGR Indonesia also supported by 623 warehouse units with installed total warehouse capacity of 1.56 million tons. Mastering the “PHP” programming language, preferably PHP Version 7.0.0. Preferably have knowledge in SAP FICO / MM / HR and experience at SAP HANA – BASIS. Have good knowledge of SAP BASE – Installation, Copy Client / Refresh / Delete, SAP Transport Management, SAP Performance Tuning.